Benedictine monk Andrew Nugent was the author of the "Molly Power" detective series. 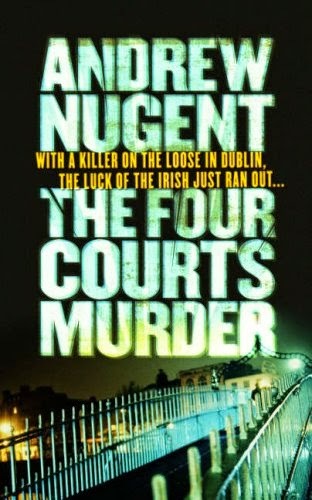 In his crime fiction debut The Four Courts Murder (2005) a Dublin High Court judge is found dead - slumped in his chair, his neck snapped by a well-aimed kick. DI Denis Lennon and DS Molly Power are put on the case. In Second Burial (2007) a Nigerian man is found in the Dublin Mountains with a leg amputated and soon after dies in hospital. The investigation by Inspector Jim Quilligan of the Dublin Murder Squad and DS Power takes them from Little Africa in Parnell Street in Dublin to Nigeria. Childhood friends Eoin and Andrew leave Strasbourg, where they are both studying, to embark upon a summer hitch-hiking through Normandy and Brittany, escaping the political turbulence of the 1968 Student Revolution. When Eoin disappears one evening and his dead body is found in a shallow grave, Andrew goes on a hunt to find the killer. Nugent took legal degrees at University College Dublin and at King’s Inns and qualified as a barrister. After two years in legal practice, he took holy orders, joining Glenstal Abbey in 1961. He was ordained in August 1968. Between 1979 and 2001 he spent a total of 10 years in a monastery in Nigeria. He was Glenstal's Prior up to 2008. He died on 24 November 2015. Seán O'Keeffe, managing director of Liberties Press, said: "Andrew had a spare, elegant writing style, and was a wonderful stoyteller, with a wide-ranging knowledge of European history, and a forsenic eye for detail. He was never afraid to express his opinions. Andrew was a consummate gentleman, and will be sorely missed."